It was a tremendous 3-0 shutout win tonight for the Montreal Canadiens over the unbelievably struggling Ottawa Senators, and it could have been ninety years ago in Ottawa, at the old Auditorium, when Aurele Joliat, Howie Morenz, and Pit Lepine came to town to battle it out with Cy Denneny, Frank Finnigan, and Punch Broadbent. It was good old hockey then, and it was good old hockey tonight. Rough, tough, feisty, ill-mannered hockey. Years ago, my ex-wife’s mother’s uncle used to tell me stories about when he was a kid and used to crawl in through a window at the Auditorium and watch Morenz and Joliat, Clancy and Finnigan, in action. It was good stuff. I wonder if Ottawa kids climb in windows now at Scotiabank Place to see Chris Neil and Anton Volchenkov. The big differences between then and now are, tonight (April 1st) there were about 14,000 more fans at Scotiabank Place than at the old Auditorium. Ottawa wears a Trojan Condom sweater now instead of the old stripes. Beer then, if it was sold, was probably about a dime. Now it’s about eight bucks. And the officiating was probably better back then. The amount of chintzy penalties called tonight was staggering. And back then, Ottawa, from time to time, were champs. Nowadays, Ottawa, most of the time, are chumps. Now, they’re going to fight it out to make the playoffs, with Washington, only two points away, breathing down their backs. Oh, how the mighty have fallen. And then we get to Montreal. With tonight’s impressive win over the Senators and two referees, the team reaches 100 points to tie with Pittsburgh for first over-all in the east. They win the Northeast division. Carey Price notches his third shutout. The team played great after a couple of sleepfests in Buffalo and Toronto. And my Ottawa friends who used to be Habs fans but are now Sens fans, are at this very moment, really pissed off and quite concerned about the state of their team. LITTLE PIECES OF INFO: Two of Montreal’s five wounded soldiers were back – Mark Streit and Guilliaume Latendresse, leaving now Koivu, Komisarek, and Bouillon still on the shelf. Ottawa’s top line of Daniel Alfredsson, Dany Heatley, and Jason Spezza actually did play. Although you’d never know it. I lived in Ottawa for 15 years. I passed out from tequila at my bachelor stag there, I was married there, my kids were born there, I drank beer with Aurele Joliat there, I got thrown down the Club Chaudiere stairs by world famous bouncer Gerry Barber near there. And all the time I was there, I was among Montreal Canadiens fans. At work, at play, in bars, at parties – the majority of hockey fans were Habs fans. Then, in 1992, Ottawa got the Senators. They’d had them once before, but in the early 1930’s, they lost them. Now the team’s back, and wouldn’t you know it, all those Habs fans I used to know are mostly now staunch Senators fans. My friends have become turncoats, traitors, ratfinks. Aren’t there laws prohibiting this? Tonight, on a cold, wintry February night in Montreal, the Canadiens, with a huge 4-3 win over Ottawa, have now closed a season-wide large gap to a tiny little 1 point difference with the Senators. Government workers at Tunney’s Pasture in the Nation’s Capital will be crying in their Starbucks Caramel Macchiato’s. I’m proud, but the team has to keep it going. They need to overtake the Sens, widen the gap, and end up the season in first place with adenaline-rushing momentum. Then I might celebrate by drinking tequila and passing out again. Then we’ll see what kind of damage can be done in the playoffs. One team in the east I think I can stop worrying about catching the Habs now is Toronto. This is a team that continues to implode like the Brittany Spears of the north, and tonight, on a cold, dismal February night in Toronto, they lost 8-0 to the Florida Panthers. I’m gonna say it again – 8-0 to the Florida Panthers. And for Habs fans, including those who were Montreal fans, then changed to Senators, then came back to where they belong as Montreal fans, click on the National Hockey League in blogroll on the right-hand side here and see the game recap on the Habs link, where Kovalev had three assists, Andrei Kostitsyn had a goal and two assists, and Tomas Plekanec has two goals and an assist. Ottawa’s Prescott Hotel, in the mid 1980’s, was the classic (and maybe still is) old beverage room with a Ladies and Escorts door, and a regular entrance. It smelled of stale beer, cigarettes, and body odour, and the trays of beer were served by guys in white shirts who looked like they were on day parole. It was my kind of a bar. It was also the Wednesday night bowling team’s kind of bar, a place where the members, which consisted of a bunch of young guys and one really old guy, got together after a big night out at the bowling lanes. I’d just read about the bowling team and the really old guy, in the paper, so I went down to the Prescott. Because it’s not every day that you get a chance to drink beer with Aurele Joliat, star player of the Montreal Canadiens in the 1920’s and 30’s, and good buddy of Howie Morenz. In the Prescott, I spotted Joliat right away. It didn’t take a rocket scientist to figure this out, as he was about 50 years older than the rest of the bowling team. So I went over and asked him if I could buy him a beer and he grumbled something and said the f word a few times, but he joined me and we ordered our beer. For the first fifteen minutes or so, he was just an old grouch, like so many geezers. He pooh poohed the Rocket when I asked him what he thought, saying Richard couldn’t lace Morenz’s skates. He grumbled about today’s hockey, saying they were all a bunch of pansies who would never had cut it in the old days. And on it went. The evening began with an old man who was testy, not really nice, and almost belligerent, and it ended with a man who was a kind and caring gentleman. I drove him home and he thanked me and said goodbye, and I wish now I would have continued this new friendship. 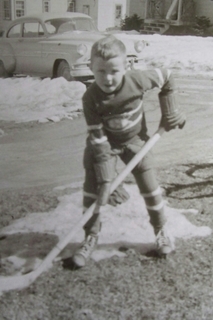 I would have loved to have seen his old photos, and maybe that little touque he wore when he starred for the Montreal Canadiens, all those years ago.